"I want regulations because I want safety, I want all environmental situations to be taken properly care of. It's very important to me." In December 2018, the United States became a net exporter of oil- and gas-based fuels for the first time in decades (Figure 1).2 These fuels provide energy for transportation, home heating, manufacturing, and more. Much of the production boom can be attributed to "unconventional" drilling operations that increase the output of shale oil and gas wells. Such operations are called hydraulic fracturing. SOURCE: FRED®, Federal Reserve Bank of St. Louis: https://fred.stlouisfed.org/series/IPG211111SQ. NOTE: MMcf, million cubic feet. 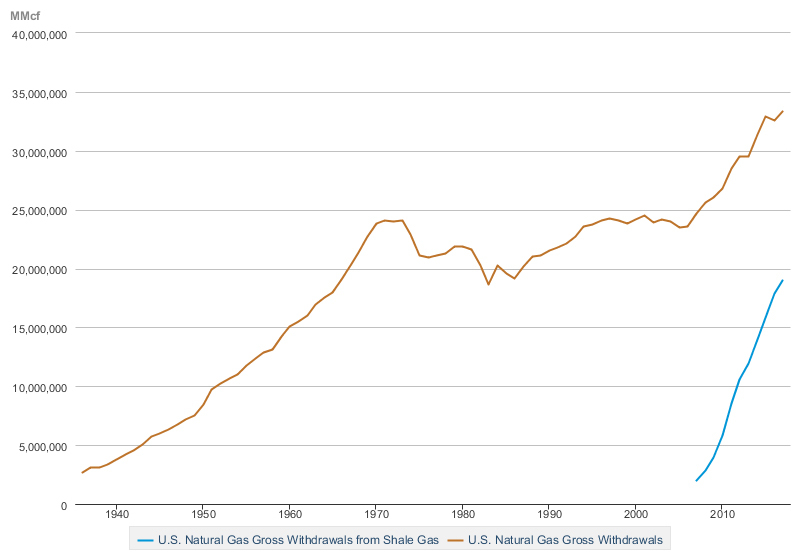 SOURCE: U.S. Energy Information Administration; https://www.eia.gov/dnav/ng/ng_prod_sum_dc_NUS_mmcf_a.htm. Regulated pollutants are chemicals that have some adverse health effects. These effects are not considered extreme when present at moderate levels in the environment. Government regulations determine when, where, and how much these pollutants may be used. Regulated natural elements occur naturally in the environment. They can have adverse health effects when present in abnormally high levels. In 2009 the EPA classified carbon dioxide (CO2) as a pollutant because of concern about CO2's impact on climate change.7,8 Humans produce CO2 naturally when breathing, but it is also emitted by the processing and burning of fossil fuels such as shale oil and gas. To better understand the need for regulation, it is helpful to first understand the demand firms have to pollute. The law of demand states that as the price of a good or service increases, the quantity of that good or service demanded decreases—and vice versa. Think about this law in the context of the goods you purchase: When the price of a good goes up (down), you naturally want to buy less (more). But why would a firm have a demand for something seemingly harmful like the ability to pollute? The answer lies in the cost of reducing pollution. If there is no cost for reducing pollution, firms can produce their goods more inexpensively and earn greater profits. Economists call this derived demand because demand is derived from the desire to avoid the cost of reducing pollution. Consider the quantity and price of pollution as shown in Figure 3. If industries do not have to put any dollars into reducing pollution, they will likely produce the maximum quantity (Q-max) of pollution created by their manufacturing methods. Therefore, if there are no limits on pollution, they will not have to pay an extra price for this level beyond their production costs. Now assume firms are required to reduce their pollution level by a small amount to abide by a regulation, going from Q-max to Q1. This reduction can typically be accomplished with some inexpensive tweaks in the production process, costing no more than P1 for each unit of reduction. However, if firms are required to achieve significant reductions (reducing pollution to Q2), they typically would have to buy expensive equipment—which brings a higher price tag. Therefore, the price of lower levels of pollution is much higher, yielding a downward sloping demand curve. Knowing the demand curve for any given pollutant allows policymakers to establish regulations limiting the amount of harm to the environment. One way to target a specific quantity (Q) is to sell and allow firms to trade pollution permits, where firms are required to own a permit for each unit of pollution emitted. This is called a cap and trade system, where a cap, or upper limit, is established on the quantity of permits at Q (Figure 4A). Once the quantity is fixed in the market, the price of permits will be determined by the demand curve. 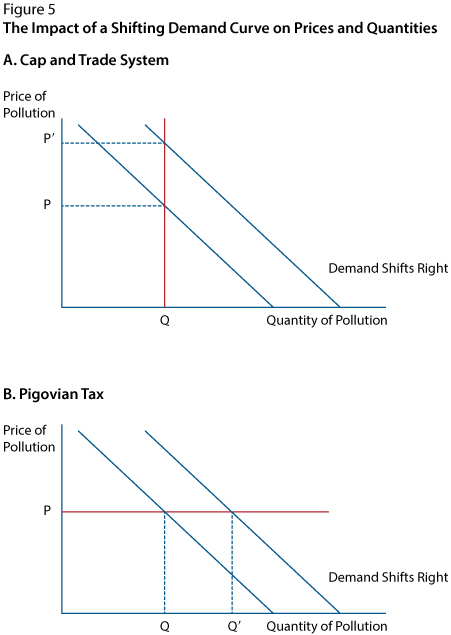 Alter­natively, policymakers could fix the price (P) by charging a tax on each unit of pollution, allowing the demand curve to determine the resulting quantity (Q) (Figure 4B). Such a regulation is called a Pigovian tax and is used to make activities that harm the environment more costly. While a cap and trade system and a Pigovian tax appear to both yield the same quantity and price, this is only true if all other market conditions do not change and the demand curve does not move. 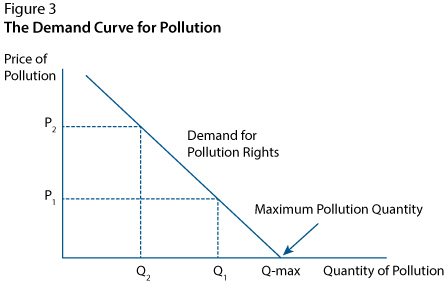 But, of course, market conditions do change and the demand curve for pollution rights wil fluctuate (Figure 5). This fluctuation will have major implications depending on whether policymakers fix the quantity and allow the price to be determined by the markets (a cap and trade system) or fix the price and allow the quantity to be determined by the markets (a Pigovian tax). Under a cap and trade system, if demand increases, the price will increase from P to P', making reductions in pollution more costly but leaving the level of pollution constant (Figure 5A). 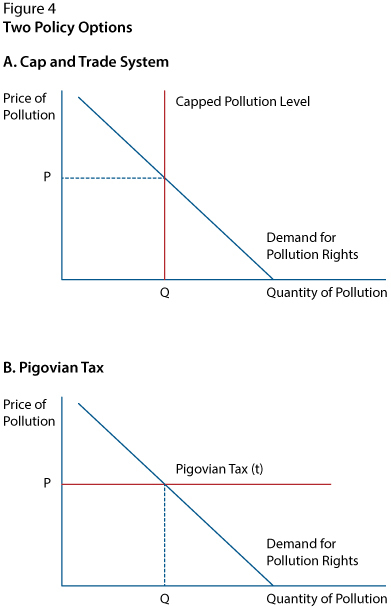 Under a Pigovian tax, if demand increases (shifts to the right), the price will remain constant but the quantity of pollution will increase from Q to Q' (Figure 5B). In this case, pollution will increase above the desired level (quantity). When designing regulations, policymakers are faced with a tradeoff: Do they strictly control pollution levels at the risk of elevated prices (undesirable to firm profits), or do they strictly control pricing at the risk of elevated pollution (undesirable to health and the environment)? The choice largely depends on the type of pollution. For example, regarding the shale oil and gas industry, environmental scientists are concerned about drinking water near drilling wells because many of the chemicals used in the drilling process are believed to be highly toxic.9 If emitted into local water sources, the impact on human health could be devastating. When the cost of environmental damage is high, regulators lean toward fixed quantity controls at the risk of elevated prices. Such quantity controls may take the form of a cap and trade system, firm-level restrictions on emissions, or even an outright ban. With CO2, a naturally occurring chemical, regulators are more concerned about atmospheric levels of CO2 in the long run and not necessarily in any given year. As a result, regulators could fix the price in the form of a Pigovian tax and allow the amount of CO2 generated to vary year to year. This would allow firms to avoid the uncertainty of suddenly elevated prices in the market for CO2 pollution permits. Thus, it is clear that the optimal environmental policy for any pollutant depends on its chemical formulation, its toxicity, and the resulting costs of its environmental impact. Economists often make the assumption of a "representative agent"—a single agent whose actions are representative of all persons in the economy. Unfortunately, there is no such thing as a representative pollutant, as each one has unique chemical and physical properties that must be considered when designing environmental policy. For example, the shale oil and gas industry uses and emits pollutants ranging from natural elements such as CO2 to toxic chemicals such as those used in the drilling process. Sound environmental policy needs to take into account the dangers of the pollutant, the needs of the industry, and the real-world behavior of the market: If a pollutant is not highly toxic, then a Pigovian tax can successfully reduce the long-term emission levels while creating price stability for firms. For a more toxic element that produces greater health concerns, a cap and trade system or other quantity control may be more appropriate, even if it creates price uncertainty for firms. 1 White House Press Briefings. "Remarks by President Trump in Press Conference." February 16, 2017; https://www.whitehouse.gov/briefings-statements/remarks-president-trump-press-conference/. 2 Olson, Bradley. "U.S. Becomes Net Exporter of Oil, Fuels for First Time in Decades." Wall Street Journal, December 6, 2018; https://www.wsj.com/articles/u-s-becomes-net-exporter-of-oil-fuels-for-first-time-in-decades-1544128404. 3 EPA. "The Process of Unconventional Natural Gas Production." https://www.epa.gov/uog/process-unconventional-natural-gas-production, accessed January 2019. 4 Union of Concerned Scientists. "Environmental Impacts of Natural Gas." https://www.ucsusa.org/clean-energy/coal-and-other-fossil-fuels/environmental-impacts-of-natural-gas#.XEaB0M17lhF, accessed December 2018. 5 EPA. "Terms & Acronyms." https://ofmpub.epa.gov/sor_internet/registry/termreg/searchandretrieve/glossariesandkeywordlists/search.do?details=&vocabName=Environmental%20Issues%20Glossary#formTop, accessed January 2019. 6 Harrington, Rebecca. "The EPA Has Only Banned These 9 Chemicals—Out of Thousands." Business Insider, February 10, 2016; https://www.businessinsider.com/epa-only-restricts-9-chemicals-2016-2. 7 McMahon, Jeff. "EPA Chief Resigns: Declared Carbon Dioxide a Pollutant." Forbes, December 27, 2012; https://www.forbes.com/sites/jeffmcmahon/2012/12/27/epa-administrator-resigns-declared-carbon-dioxide-a-pollutant/#2f159d9c3a7a. 8 Lindsey, Rebecca. "Climate Change: Atmospheric Carbon Dioxide." Climate.gov, National Oceanic and Atmospheric Administration, August 1, 2018; https://www.climate.gov/news-features/understanding-climate/climate-change-atmospheric-carbon-dioxide. 9 Greenwood, Michael. "Chemicals in Fracking Fluid and Wastewater Are Toxic, Study Shows." YaleNews, January 6, 2016; https://news.yale.edu/2016/01/06/toxins-found-fracking-fluids-and-wastewater-study-shows. Market: Buyers and sellers coming together to exchange goods, services, and/or resources. Environmental policy: Laws, rules, and regulations that are proposed or adopted by a government, businesses, or individuals to protect the natural world. Regulations: Rules that seek to produce positive impacts or avoid negative impacts by setting standards or controlling the use of a product or process. Demand: The quantity of a good or service that buyers are willing and able to buy at all possible prices during a certain time period. Derived demand: The demand for a good or service that helps to acquire or produce another good or service. Tax: A fee charged on business and individual income, activities, property, or products by government. Pigovian tax: A tax used to correct for a negative side effect (such as pollution) that results when the production or consumption of a good or service affects the welfare of people who are not the parties directly involved in a market exchange. Cap and trade system: A regulatory program in which governments or organizations cap the total amount of pollution and allow the trading of rights that are given or sold for each unit of pollution. Tradeoff: Giving up some of one thing in order to gain some of something else.